With the summer getting better of me, I was craving for a cool place to escape. At the same time, it had been quite some time since an amazing trek to the Valley of Flowers in Uttarakhand. A night trek had been on my mind for a while and it made perfect sense now to plan that, as I had no mood to venture out in the summer sun. After talking to a couple of friends and shortlisting destinations, I finalised on Kunti Betta. My reasons were, a. I wanted a fairly simple trek since it was my first night trek, and b. I wanted it to be as closer to Bangalore as possible. And Kunti Betta satisfied both the conditions, without further ado, I enrolled for the trek with a local trekking club. Located around 130 km from Bangalore, Kunti Betta is a two rocky hill structure located in Pandavapura of Mandya district of Karnataka. With its steep rock faces, the hill is at an elevation of 2882 m above sea level. Pandavapura has a historic importance as it is believed that the five Pandava brothers along with their mother Kunti stayed here during their exile. It is also said that Kunti and the Pandavas had developed a fondness towards the hills and therefore the hills are named after her and the place is named after the Pandavas. There is a temple at the foot of the hill, which makes it a well-known pilgrimage destination. On a Saturday night, I boarded the bus that was arranged by the organizers, at MG Road about 9 PM. The distance between Bangalore to Kunti Betta is around 130 km and we covered it in under 4 hours. With the thought of walking at the wee hours of the night, I decided to conserve energy and dozed off during the short ride. I had kept the GPS on, to track the route for my records. The route taken was Bangalore - Bidadi - Ramanagaram- Mandya - Pandavapura- Kunti Betta on SH-17. The bus dropped us at the destination around 1 AM. We all alighted the vehicle for a quick briefing. I joined the remaining participants and befriended a few. Carry a sturdy backpack with good back and shoulder support. Pack an extra pair of clothes, a light jacket, packed food, water bottle, basic/personal medicine and toiletry kits, sleeping bag and a torch. I visited Kunti Betta in March. However, the best time to visit it during the day is around the cooler months between September and February. Trekking in monsoons is not recommended as the path gets slippery. Visiting in summer is not recommended unless you are specifically going for a night trek. The temperature at the summit is pleasant during the night, even in summers. It was a clear night with a waxing crescent of the moon. With the torches on, we followed the instructions of our trek leader. The initial stretch passed through a clearing leading tothe hill. This was the easy part of the trek. Soon the terrain changed and we were gradually ascending. In the insufficient night light, I saw the path was surrounded by boulders. At one point, almost halfway through the hike, the path became narrow, passing between huge boulders. It required us to drop our bags through the passage and push ourselves to climb through the gap. Except for a few stretches, the trail was a fairly simpler one, with a well-trodden route. I was being extra careful and walked rather cautiously. The entire climb took about 2 hours at a moderate pace. Climbing a hill in the calm of a night, was one of its kind experience for me. It even drizzled for a few minutes, just enough to cool the air. A little after 2:30 AM, everyone had managed to reach the summit after a 2 km trek. It was a completely rocky area surrounded by more boulders. However, it was a comparatively flatter area with gentle slopes. There was a tall stone pillar on the top, which was our camping ground for the night. We walked and stretched a bit. Soon, a bonfire was lit and everyone gathered around it. After hanging around for some time, I looked up for a spot to spread my sleeping bag. I snuck into the sleeping bag watching the moon and sky in the night sky above. Within a few hours, the dawn broke and the surroundings turned into a picturesque landscape. 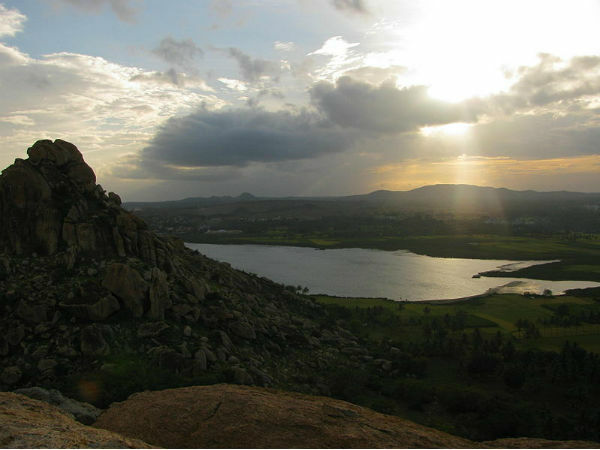 The stone pillar was actually the viewpoint that provided panoramic views of the Pandavapura Lake, also known as the Thonnur Lake, and surrounding fields. The sunrise was a beautiful view, adding to the tranquillity of the place. Little after sunrise, we started climbing down. I noticed how beautiful the path was, only when we were descending in the morning. The hill looked astounding with its rock faces. The boulders we passed earlier in the dark, were actually volcanic granite rocks and boulders and were really massive. The rocks and boulders formed various shapes and often are used as markings. We visited the temple at the base. There was a small restaurant-like set-up near the parking ground. We brushed our teeth and freshened up. We ate the breakfast arranged by the tour organizers and started back for Bangalore.